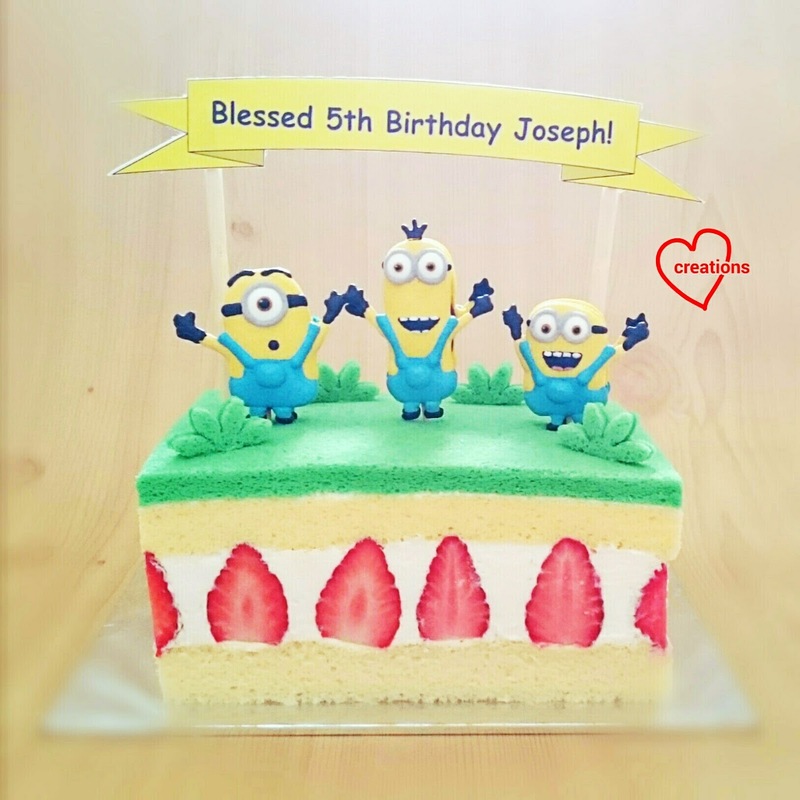 My friend requested for a Minion strawberries and cream cake for her son's birthday. Here it is! You can almost hear them shouting "Happy Birthday!" The Minion cake toppers are macarons filled with dark chocolate ganache. 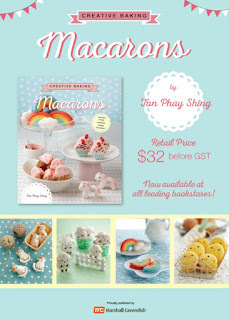 You may refer to this post for the macarons. I gently inserted a toothpick into the filling of each macaron so that the macaron figures are able to stand on the cake. As my friend prefers a less sweet cake, I have taken care to use less sugar in the cake for a light tasting version. If you have a sweet tooth, do increase the amount of sugar used. 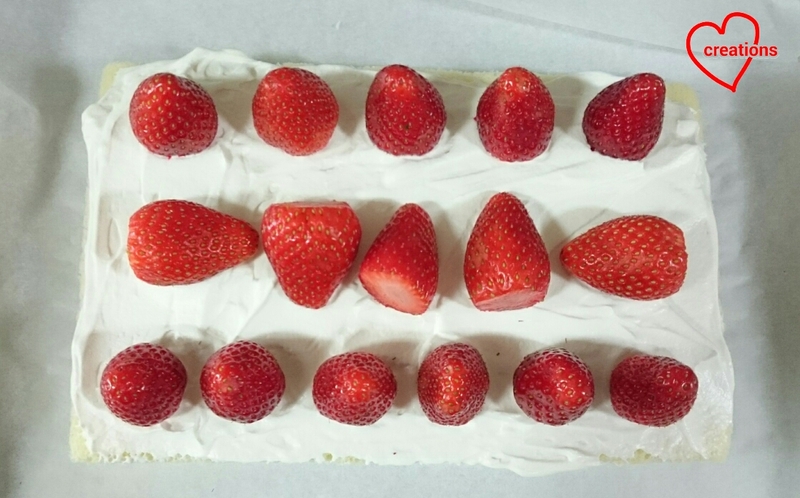 I created a rectangular cake without the help of cake rings. I will show you how it is done in this post. The cake is mounted on a 6x9" cake board. 1. Line baking trays with baking paper. Set oven rack to second lowest position. Place a tray of water at the bottom of the oven (optional). This is to create steam. Preheat oven to 160°C. 2. Prepare egg yolk batter. Whisk together egg yolks and sugar until pale and thick. Add oil and whisk until combined. Add milk and vanilla extract. Whisk until combined. Gradually add in sifted flour and salt. Whisk until no trace of flour is seen. Add colouring and mix well. 3. Prepare meringue. With an electric mixer, beat egg whites with cream of tartar until firm peaks or just reaching stiff peaks, gradually adding sugar once the egg whites are foamy. 4. Quickly but gently fold the meringue into egg yolk batter in three additions. Pour into prepared trays. Tap the trays on table to release trapped air. 5. 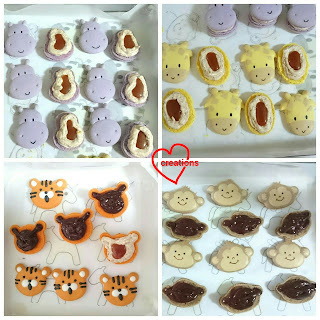 Bake for 13-18 minutes depending on thickness of layer. Use a toothpick to check for doneness. 6. Flip the cake onto another baking sheet and gently peel the baking sheet off from the cake. Cool with baking sheet over cake. 1. Chill the mixing bowl or prepare an ice bath that can fit the mixing bowl. 2. Beat the cream with icing sugar until firm peaks form. 3. Add vanilla and beat until stiff peaks form. 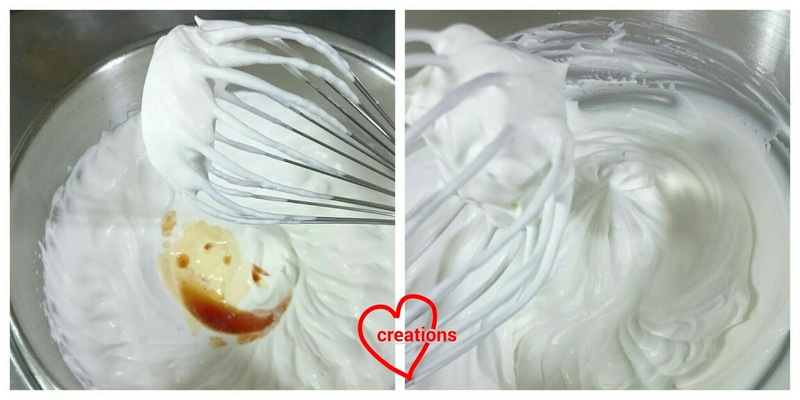 If using pure dairy cream, be careful not to over whip or the cream will separate. 1. Place cakeboard on a tray lined with baking sheet for easy removal and transport of the cake in between steps. 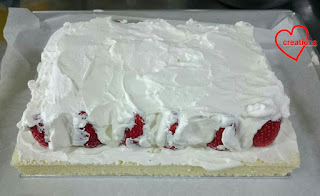 Cut the base vanilla cake according to size of cakeboard with a long serrated knife. Do the same for top vanilla cake and thin green layer cake. 2. Apply a thin layer of cream with spatula. Place strawberries on. 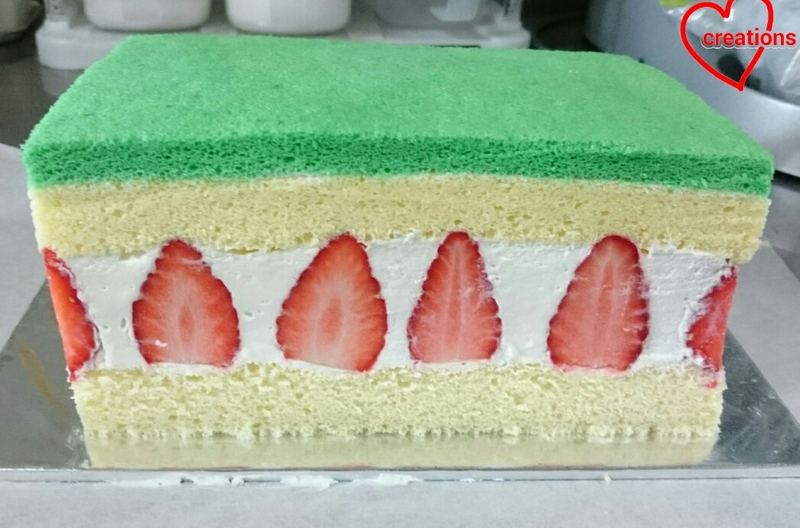 Cut the strawberries to roughly the same height to ensure the top layers of cake are level. 3. Pile up more cream to cover the strawberries. 4. Place plain vanilla sponge on top to sandwich the strawberries and cream. 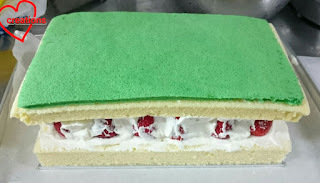 Apply a very thin layer of cream and place the green layer cake on top. Both pieces of cake are cut to roughly the size of the cakeboard. 5. Press the cake down firmly but gently to squeeze the cream into the crevices between the strawberries. 6. Freeze for 1h with cling wrap covering the whole assembly. Use a long serrated knife to cut the edges to reveal strawberries. Wipe knife cleanly after each cut. Decoration is simple but cute enough. 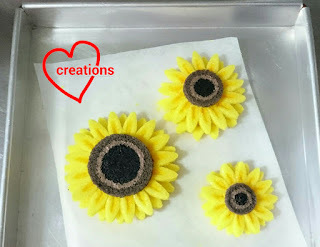 Simply use a daisy flower cookie cutter to cut out some green cake and half it with a knife to create some tufts of grass. Stick them on with a bit of cream. You may wish to brush a little syrup (dissolve 10g sugar in 20ml water) on the "grass" to keep it moist. As quite a few words are required for the birthday message, I decided to print out a banner instead of thinking about how to write it with food. The way the minions are posing is screaming for a banner to be over their heads! 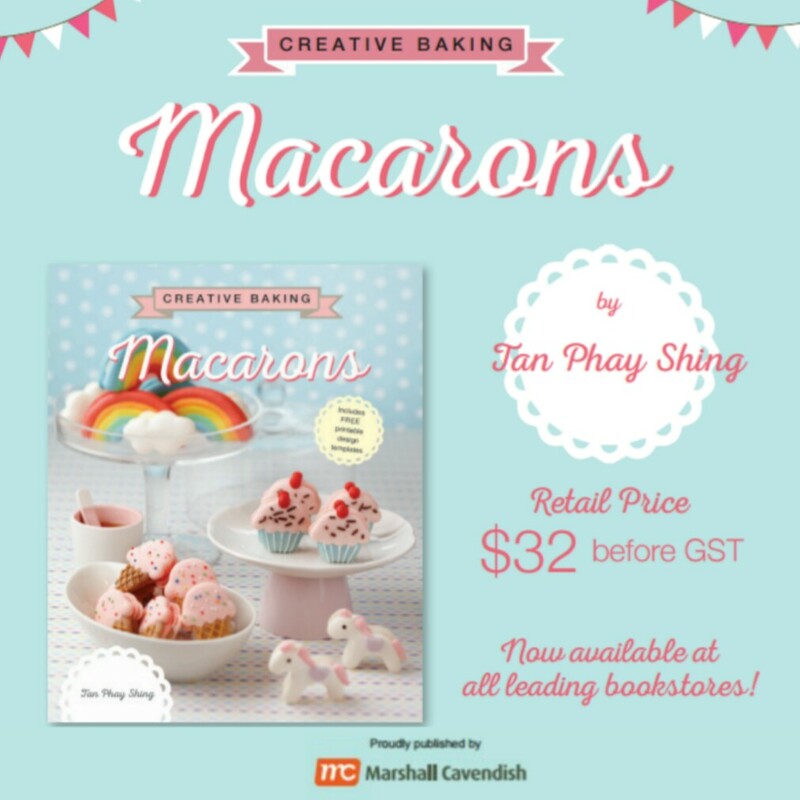 Pack the macarons in a separate box and assemble them on the cake just before serving. Store both cake and macarons in the fridge. Best served the day after assembly! Thank God everyone loved the cake and macarons! 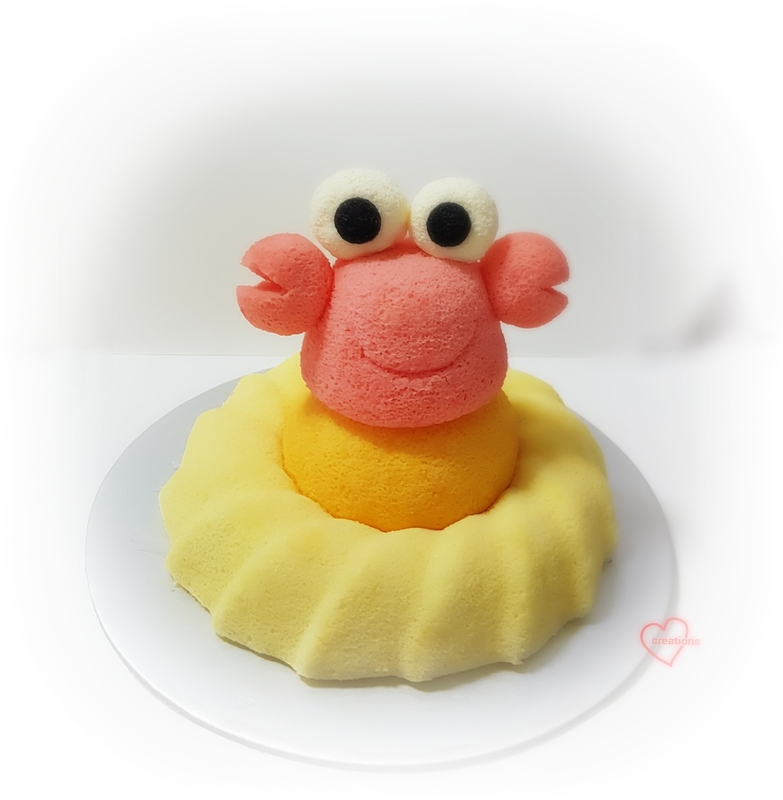 I made this 'Crab' Salted Egg yolk Chiffon with flowing Salted egg yolk lava for my dad's birthday, and also to try out for one of the cakes in the 2nd chiffon book, Deco Chiffon Cakes that I am working on right now. It's seriously good!! I make chiffon cakes day in and day out but I can tell you this is seriously good! I'm so in love with this flavour and the oozing custard, and also a big fan of the salted egg yolk lava croissant! 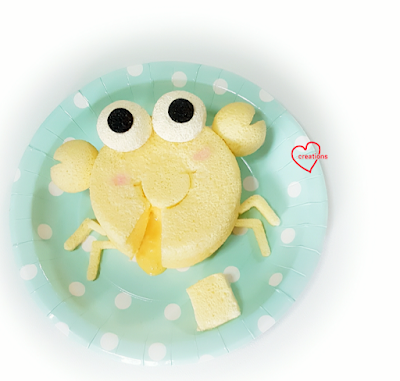 My dear daddy loves crabs and salted egg yolk, so he inspired the design. The recipe/technique will be in the Deco Chiffon Cakes coming out soon this year though I really can't wait to share it with you. 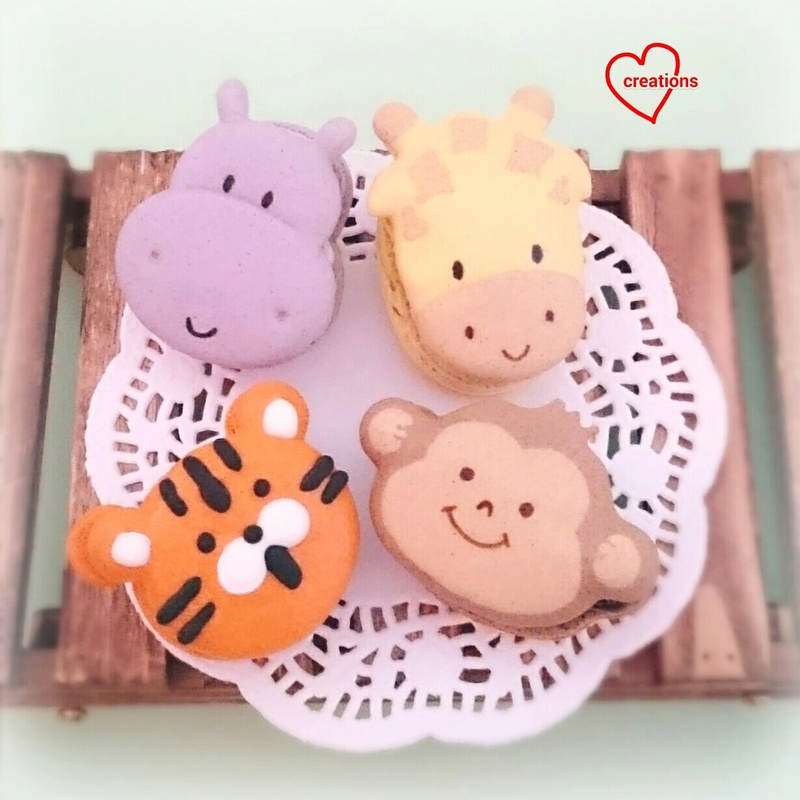 I made this a couple of months ago but finally deciding to post it because this post has been "collecting dust" sitting as a draft :p. I had a request for safari themed macarons but with a slightly different set this time compared to my first attempt last year :). Instead of zebras, I made monkeys! Natural food colouring was used as far as possible. 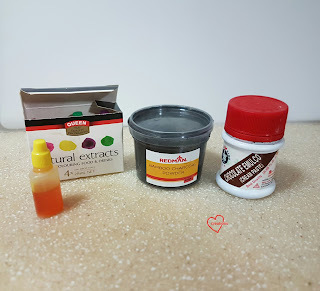 Carrot powder for orange, purple sweet potato powder for purple, Queen's natural sourced yellow powder for yellow and Dutch processed cocoa powder for brown. 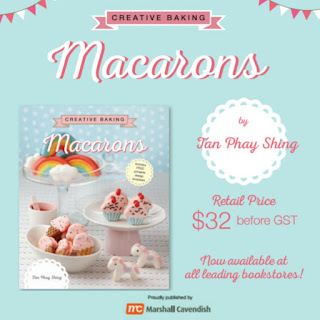 Checkout my Creative Baking: Macarons book for a more systematic and detailed step by step writeup of macaron basics and pointers! * add a few grams of natural powders per 100g of almond. For light brown, start off with a pinch first. Gradually add until a shade you like is obtained. Remember that the shade will lighten up significantly when meringue is added. Add a little yellow and orange gel food colouring to brown to make the shade warmer. Here's a photo of the carrot powder my hubby bought from Akari at Anchorpoint! 1. Make the mass. Sift together icing sugar and almond powder. Add 80g of egg white and mix well to form a thick paste. 2. Divide the mass into the ratio of 2:2:2:1:1 for orange:purple:yellow:light brown:dark brown. You may have excess of some colours but it's easier to divide this way. 4. Make the Italian meringue. Heat caster sugar and water in a small sauce pan without stirring until the syrup temperature reaches 115°C. In the mean time, beat 80g of egg whites in a clean metal bowl with electric mixer at medium-low speed until foamy and opaque. Do not beat past the soft peak stage. Turn the mixer speed down if necessary to keep egg whites moving. Once syrup reaches 115°C, remove from heat, turn mixer speed up to medium-high and slowly pour the syrup into the egg whites. Keep beating for 10 minutes until meringue is stiff, glossy and cool. 5. Divide the meringue into the ratio for the various colours, or follow this formula that I use for meringue: mass ratio by weight, I.e. weight of meringue/weight of mass=0.55. By following this formula, you will end up with a little meringue leftover, which can be used to stick the baking paper onto the tray. Fold the meringue into the masses in two additions, with the first addition using about a third of the portion. Do watch my video demo for the macaronage process and how to test if the batter is ready. Fold until batter moves in a slow-moving lava-like manner. 6. Transfer batter into piping bags fitted with a Wilton #10 tip for most of the piping, except for fine parts where you may want to transfer about 1-2 tbs of batter into piping bags fitted with a Wilton #5 tip. You may refer to the video tutorials here for piping simple shapes and here for piping complex shapes. 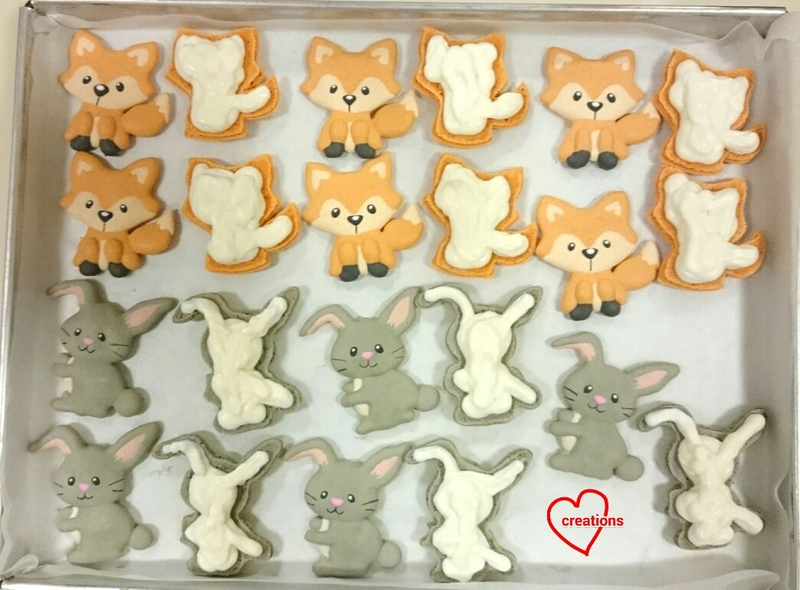 Remember to bang the tray a few times on the table after piping. 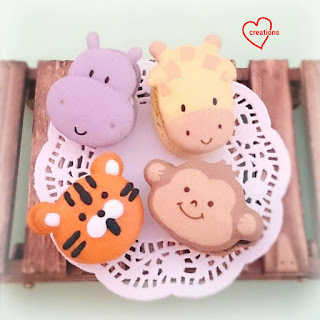 Giraffe is the same as my previous safari bake. To pipe the monkey, start with the dark brown outline, then fill in the light brown part of the face. Tiger is the same as my previous safari bake. 7. Dry the piped shells under a fan or in an aircon room for 1-2 hours or until the shell is dry to touch. 8. 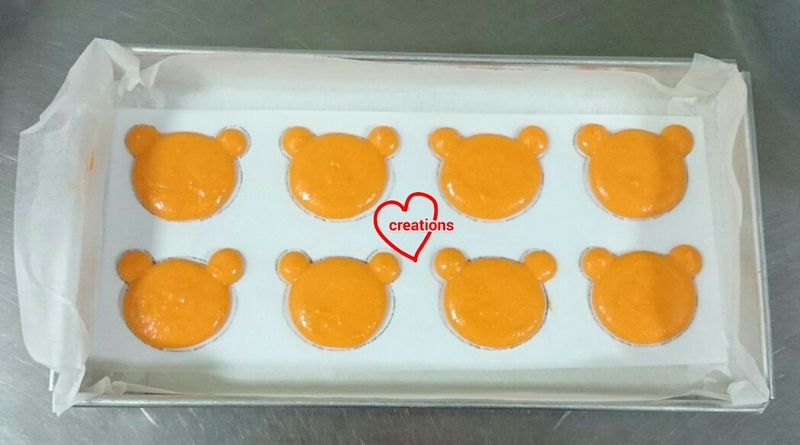 Bake in preheated oven at 135°C for 17-20 minuted with oven rack set at lowest position. Bake for a few minutes more at 120°C if the shells are still stuck to the baking sheet or the feet appear wet. Let the shells cool before removing from baking sheet. They should be able to come off the sheets easily if properly baked. 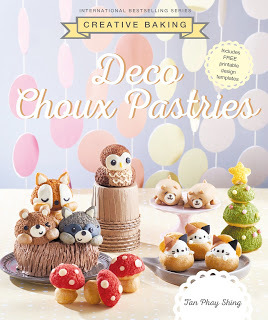 Use royal icing and edible marker to decorate the shells as desired. 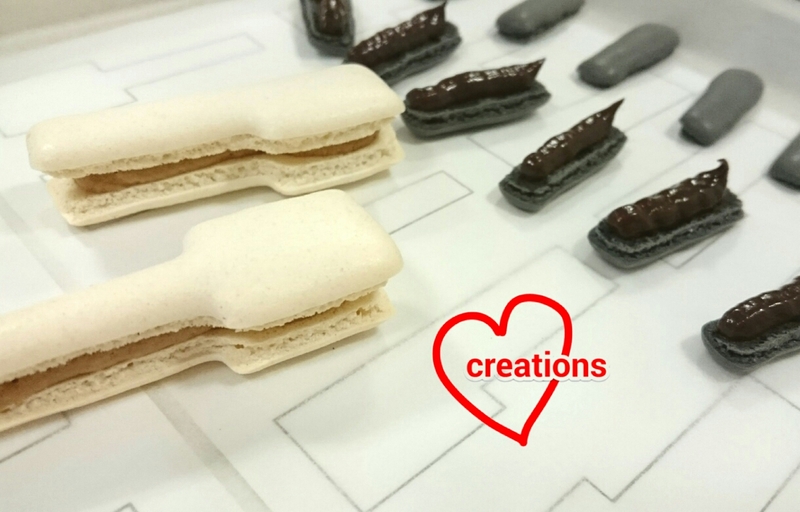 I filled the macarons with spiced apple swiss meringue buttercream and salted caramel or dark chocolate ganache. 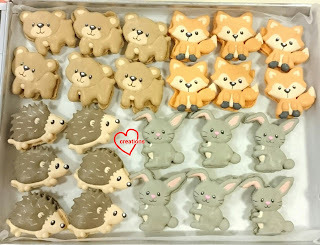 Enjoy these cute treats! I heard they were gone from the dessert table at the party really fast! 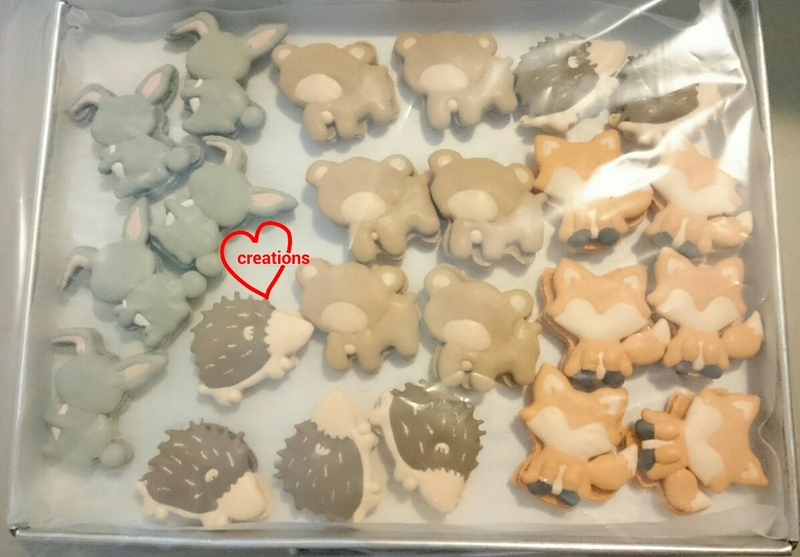 When I received the reference pictures of a set of woodland creatures to make into macarons, I was so charmed by them that I knew the final product would be gorgeous and enchanting! Here they are! Don't they look like they popped out of a storybook? I can almost imagine them talking to each other! I used the basic recipe without sugar reduction for these macarons as I was making other complex shaped macarons at the same time. Please refer to this post for video tutorials of macaron basics, this post for video tutorials of piping complex shapes and my Creative Baking: Macarons book for more details and pointers. I will just briefly describe the process here. 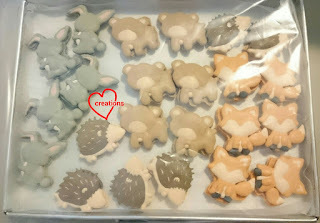 * These are the natural and artificial food colouring I used for the various colours. I didn't measure the exact amount but added a little at a time until I was satisfied with the shade of colour. I apologise for the imprecise colouring measurements here. It would have taken too long to work out the exact amounts so I played by ear. 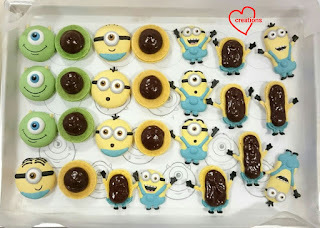 I made these along with the piano keyboard, Charlie Brown and Snoopy macarons. 1. 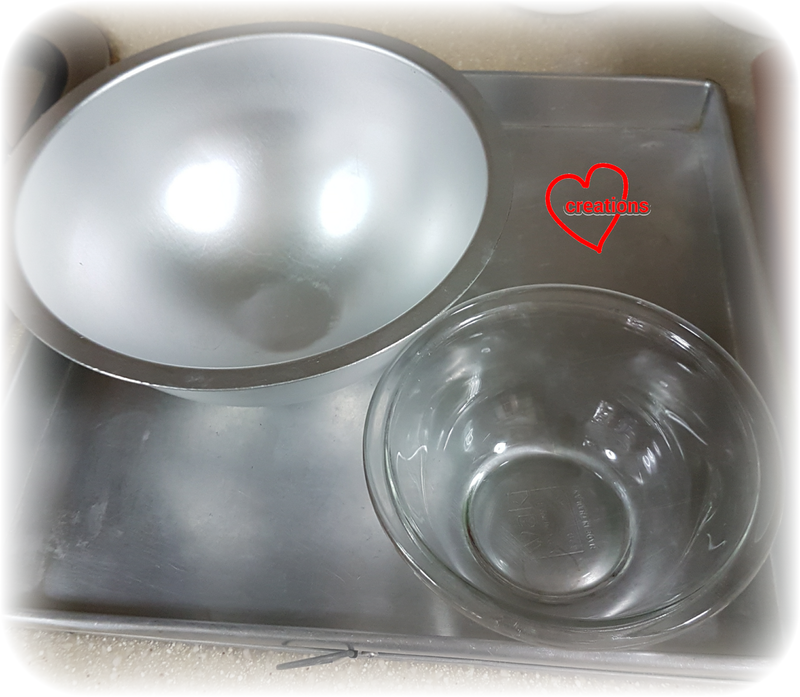 Prepare baking tray with template and baking sheet. 2. Prepare mass. Combine sifted almond and icing sugar in a large bowl. Add egg whites and mix well to form a paste. Divide mass into portions for different colours. Add respective colouring. Divide the mass according to estimated percentage of surface area that each colour covers. 3. Prepare Italian meringue. Heat sugar and water in a small saucepan until 115°C. In the mean time, beat egg whites in clean metal bowl with electric mixer at medium low speed until soft peaks form. Reduce mixer speed if necessary. Once syrup is ready, increase mixer speed to medium high and carefully pour syrup into egg whites in a thin stream. Continue beating on high for 10 minutes or until meringue is stiff, glossy and cool. 4. Divide meringue into portions for the different coloured batters according to formula weight of meringue = 0.55 x weight of mass. Fold meringue into mass in two additions until batter flows off the spatula in a slow-moving lava-like manner. 5. Transfer into piping bags fitted with round piping tips of appropriate sizes and pipe. Remember to bang the tray on the table after each stage of piping. Use a toothpick to pull the batter where necessary or to pop stubborn air bubbles. 6. Dry the shells under the fan and/or in an air-conditioned room for 1-2 hours or until the shells are dry to touch. Preheat oven to 140°C towards end of drying time. Set rack to lowest position. 7. Bake for 10 minutes. Rotate tray and bake at 130°C for another 7-8 minutes before checking the feet of the shells to test for doneness. 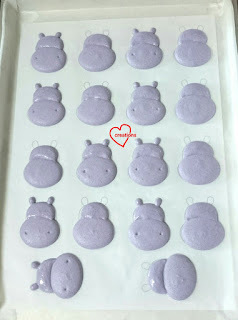 If the feet appear wet, place the macarons back in the oven and bake for another 5 minutes at 120°C. Cool completely before removing shells from baking paper. I stored the shells like this overnight to work on them the next day. Simply put the whole tray of shells into a jumbo ziplock bag. 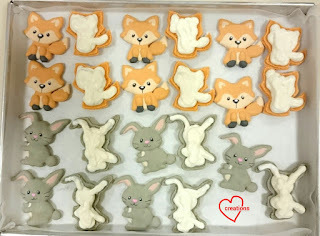 Add on the details with royal icing and edible marker. 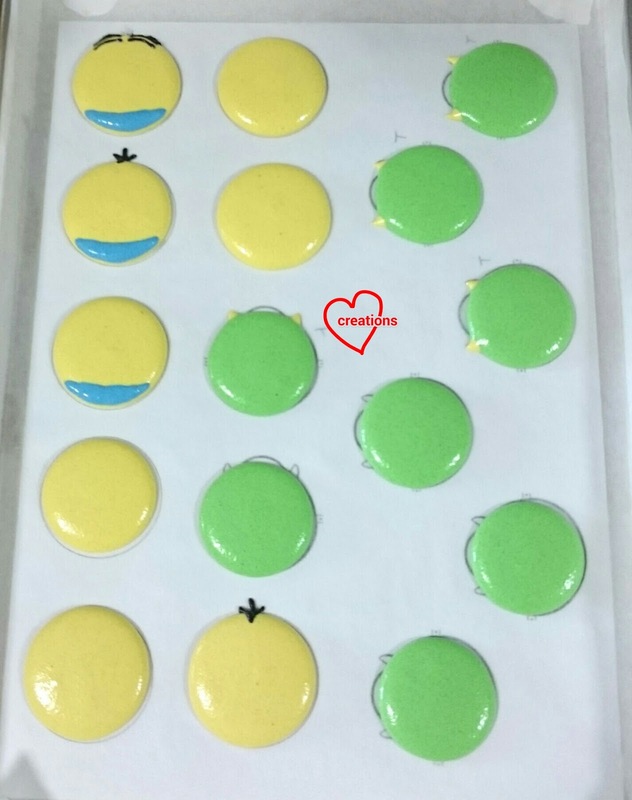 I filled half of the macarons with whipped coconut white chocolate ganache. This is a new flavour and so glad that the coconut aroma is strong! 1. Place white chocolate, shortening and oil into a microwave-safe bowl. Heat at medium power for 10-20 seconds and stir. Repeat until all the white chocolate is melted. 2. Place coconut cream in a small saucepan and heat at low heat until it bubbles. Pour into white chocolate mixture and stir in one direction until combined. 3. Add salt and coconut flavouring (if using) and stir with spatula until well combined. 4. Freeze for 2 minutes and stir with spatula until mixture is even. The mixture may separate if you store it longer in the fridge but that's ok. Just repeat until consistency thickens and becomes toothpaste-like. 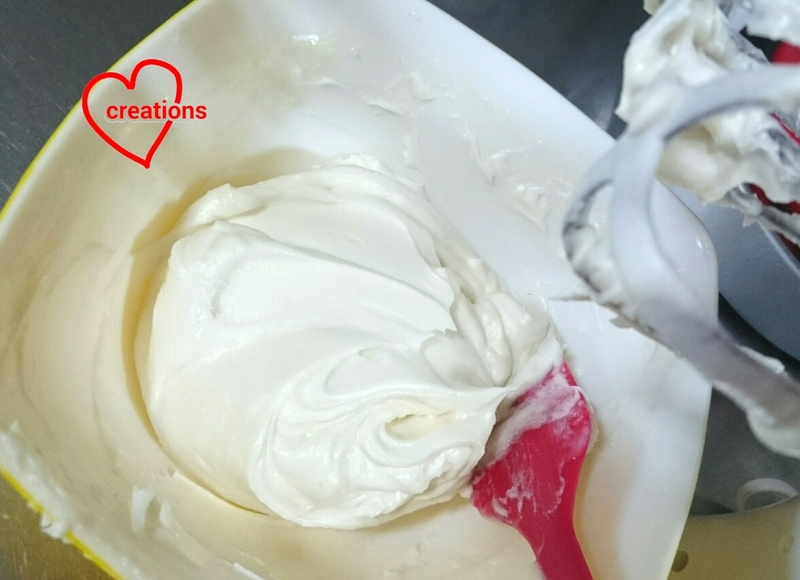 Switch to electric mixer and beat on medium low speed until smooth and creamy. About a couple of minutes. You may need to repeat freezing the mixture for another minute before beating with electric mixer again if the cream is too runny and unable to hold a stiff peak. An ice bath may work too if you don't want to keep putting the mixture in and out of the freezer. Creamy and smooth whipped coconut ganache! Very coconut-y too! I filled the other half of the macarons with salted caramel swiss meringue buttercream with pure salted caramel at the center. 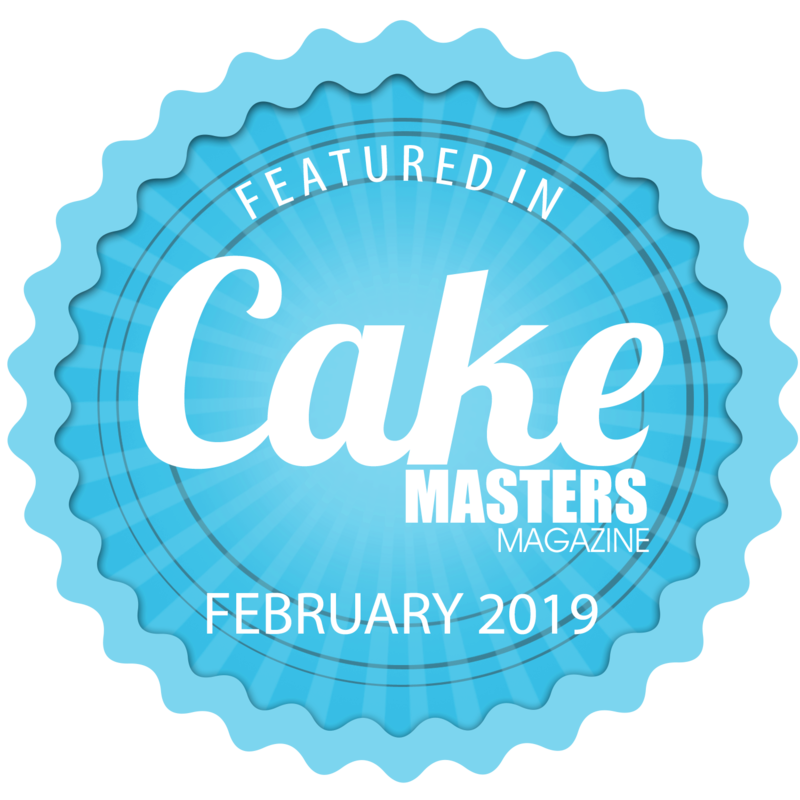 You may refer to this post for the basic swiss meringue buttercream recipe and the salted caramel recipe. Make salted caramel swiss meringue buttercream by beating together 80g of salted caramel with every 100g of swiss meringue buttercream. So glad these were very well received at the party! 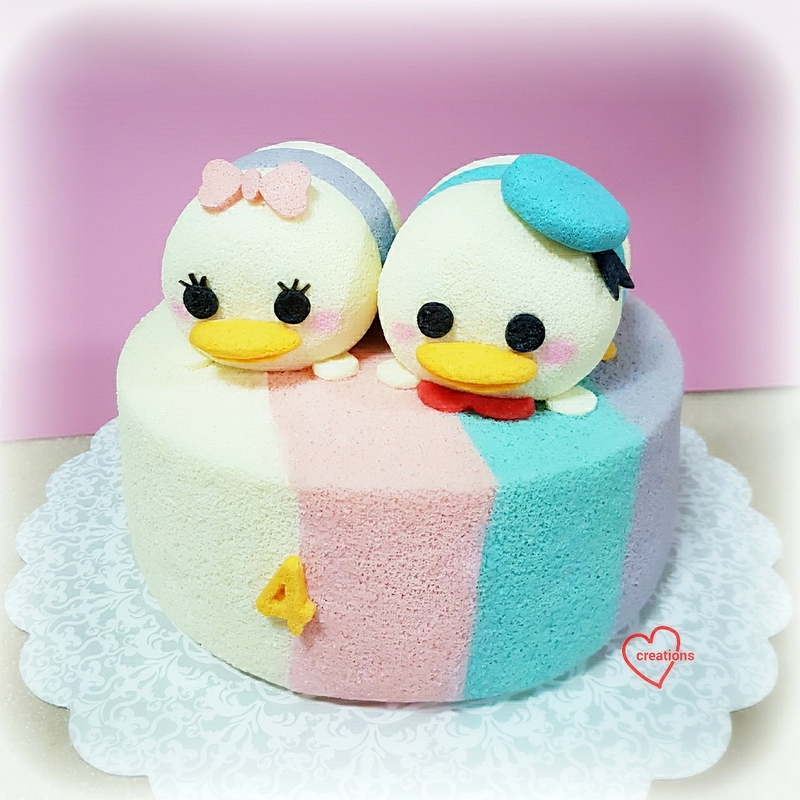 I made this Donald and Daisy Tsum Tsum for an old school friend! 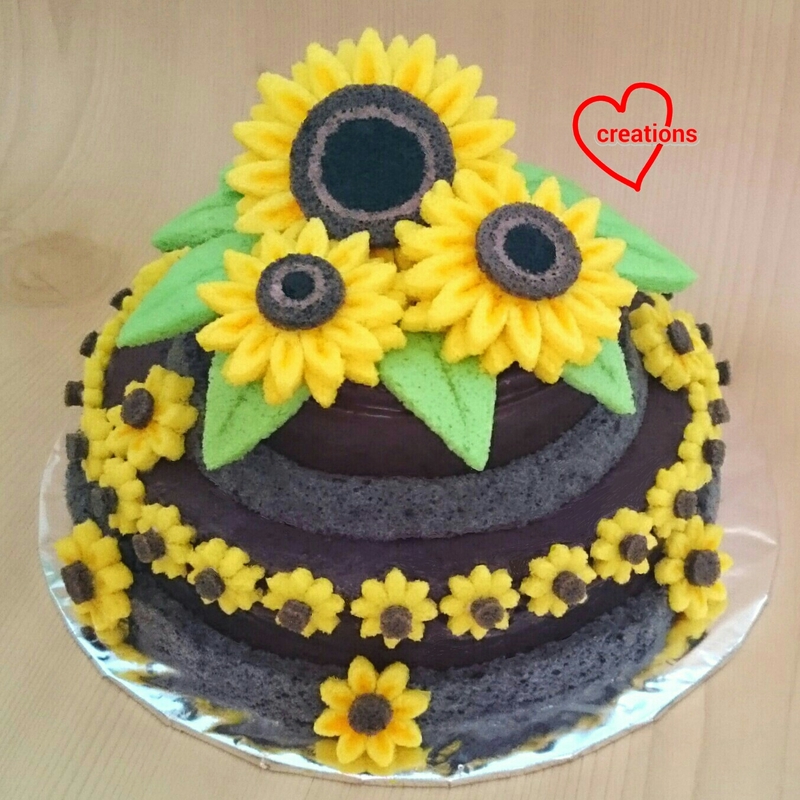 It was one of my last cakes before my month long break to prepare for chiffon cakes for photoshoots for the new cookbook Deco Chiffon Cakes. 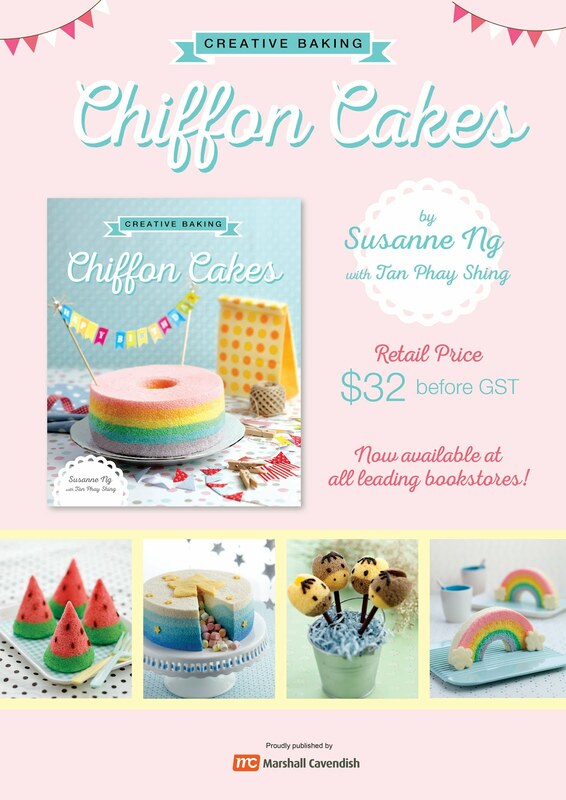 The recipe for the Rainbow Stripes Tiedye Vanilla Chiffon Cake is here. Here I used a round 9-inch tube pan. So I scaled the recipe 'divided by 5 times 8'. Baking time as follows: 160°C for 15 min, 150°C for 10 min, 140°C for 20 min, then 130°C for 15+ min, or until skewer comes clean. The temperature gradient is to prevent browning. The Tsum Tsum is made the same as as my Rainbow Pooh Piglet Tsum Tsum. I used two 4-inch Iwaki glass bowls (picture below) to sandwich a chiffon cake from a 4-inch tube pan (you know those super mini cute ones in baking shops). The beak was cut from cake pops and I baked a charcoal chiffon sheet cake to cut out the facial features. Rosy cheeks from Americolour pink food marker. Thankful cake was well-received and the little girls were so happy and cute! 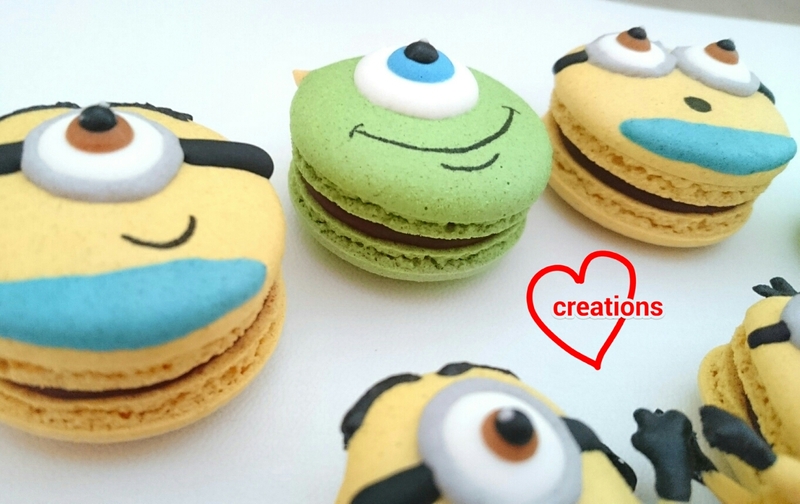 These macarons are actually for two different requests that came about the same time. 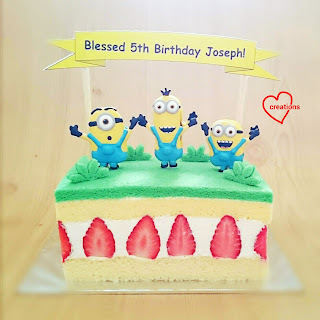 The full-bodied minions are cake toppers for a strawberries and cream cake for my friend's son. 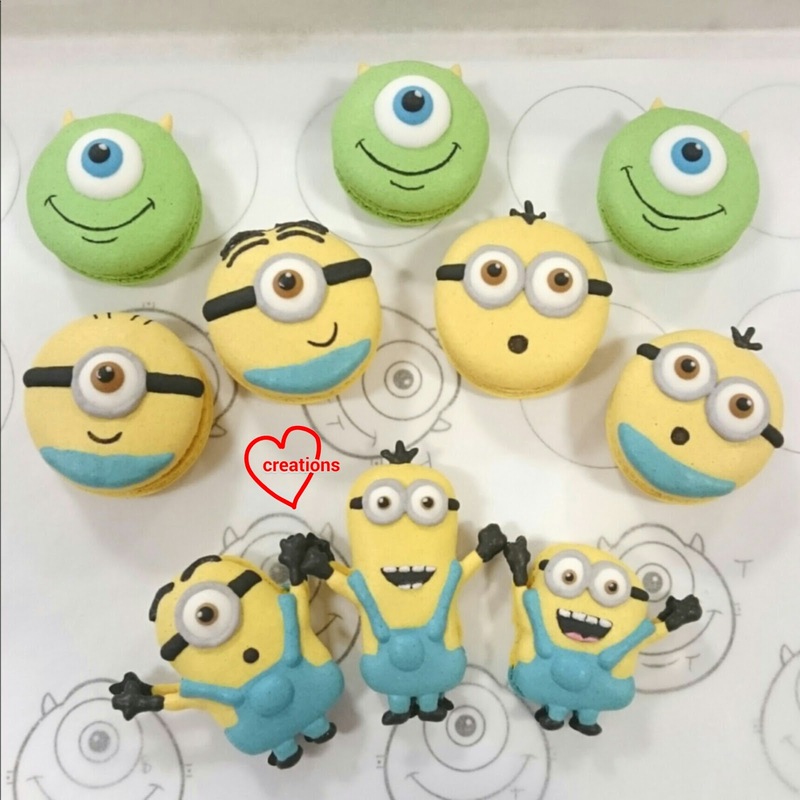 The head-only version of the minions and Mike are for my cousin's fiance. 2. Prepare mass. Combine sifted almond and icing sugar in a large bowl. Add egg whites and mix well to form a paste. Divide mass into portions for different colours. Add respective colouring. Divide the mass according to estimated surface area that each colour covers. 3. Prepare Italian meringue. Heat sugar and water in a small saucepan until 115°C. In the mean time, beat egg whites in clean metal bowl with electric mixer at medium low speed until soft peaks. Reduce mixer speed if necessary. Once syrup is ready, increase mixer speed to medium high and carefully pour syrup into egg whites in a thin stream. Continue beating on high for 10 minutes or until meringue is stiff, glossy and cool. 5. 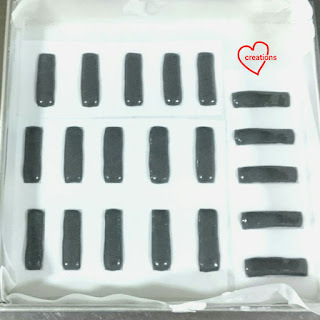 Transfer into piping bags fitted with round piping tips of aporopriate sizes and pipe. Remember to bang the tray on the table after each stage of piping. Use a toothpick to pull the batter where necessary or to pop stubborn air bubbles. 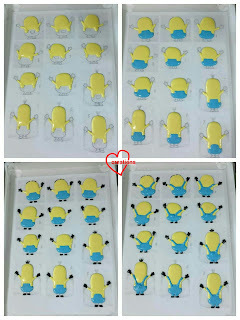 Piping full-bodied minions in stages. 7. Bake for 10 minutes. Rotate tray and bake at 130°C for another 7-8 minutes before checking the feet of the shells to test for doneness. 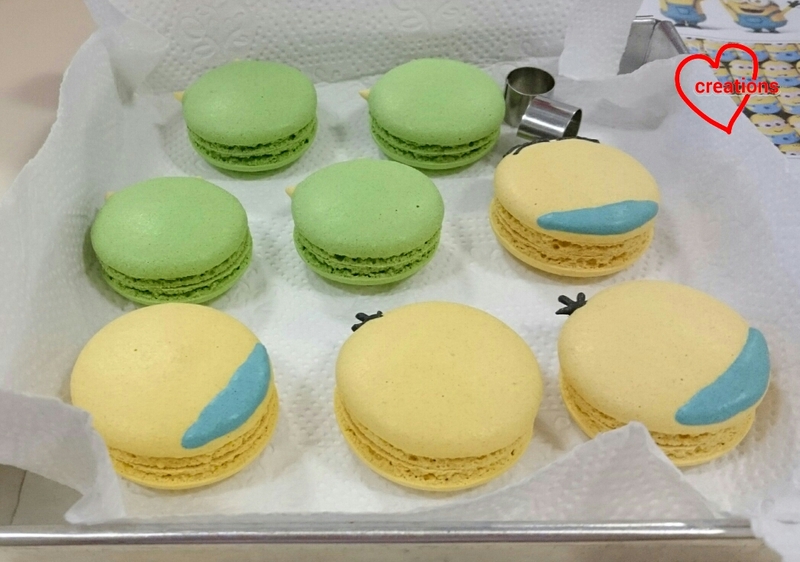 If the feet appear wet, place the macarons back in the oven and bake for another 5 minutes at 120°C. Cool completely before removing shells from baking paper. 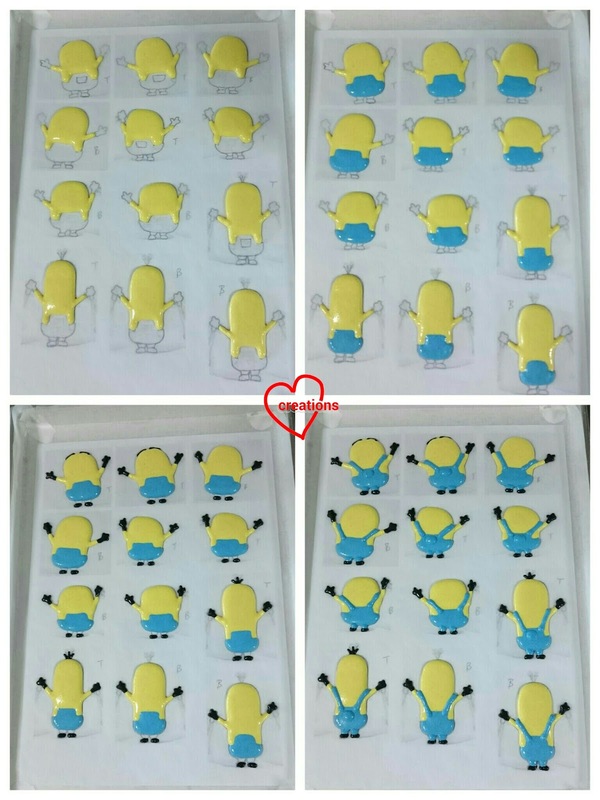 Be extremely careful with the full-bodied minions as the arms are fragile and prone to breaking. I broke one arm off a minion while removing it from the baking sheet. Add on the details with royal icing and edible marker for the mouth. I filled the macarons with dark chocolate ganache. Refrigerate in airtight container for at least 24h before serving. Here's a closer look at the awesome feet! It's my first humble attempt at making a mini tiered sponge and pudding cake. 4" cake on top of a 6" cake. 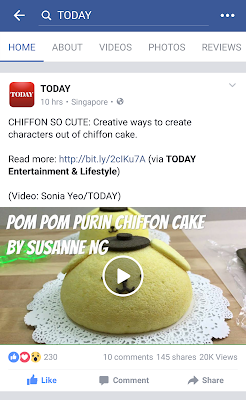 You may refer to this post for the details on how to make the pulut chiffon sponge and pudding from the pulut hitam porridge itself. That post has a very detailed description so I will not go into details here. I have made black glutinous rice chiffon cakes before from black glutinous rice flour. 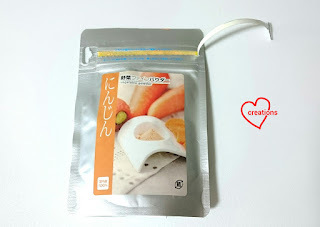 However, this flour is not easily available in Singapore whereas packets of black glutinous rice grains are available in regular supermarkets. If you feel really lazy and don't want to go through the hassle of making the porridge, you may buy from your favourite dessert stall and make the cake with it. Adjust the amount of sugar added if you are using store bought porridge. My homemade version may be less sweet than what is sold outside. This is a cake that came about much experimentation to get the right balance of strong pulut hitam flavour with complementary coconut milk, Pandan and gula melaka flavours. Victoria of Victoria Bakes tried out the pulut hitam porridge and chiffon sponge recipes with some minor adaptations and made a swiss roll. She highly recommends the recipe so do give it a try if you are a fan of pulut hitam. The details on how to make the sunflowers can be found in our Creative Baking: Chiffon Cakes book so I will not type it out here. Instead of orange flavoured cakes, I used Pandan flavour. 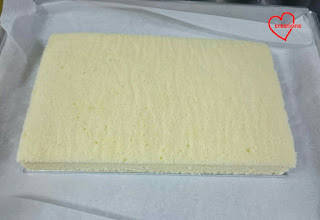 I made Pandan juice, let it settle in the fridge for a couple of days and used the clear liquid at the top for making yellow and dark brown sheet cakes, and the dark green portion for making the green sheet cake for the leaves. Thank God that the cake was very well received by both young and old. Grandma loves it because it is not too sweet. Brother loves it because it is not too light (yes not everyone loves the lightness of plain chiffon cakes). My elder kid who is not a fan of cakes in general had 3 helpings and my hubby with a picky palate says it's good. Iced gems, the stuff of our childhood! 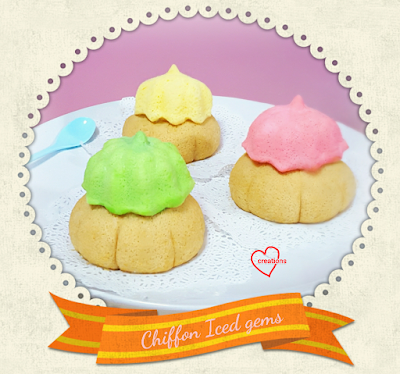 I actually made these Chiffon Cake Iced Gems a couple of months back requested by a friend. It was such a unique request it took me a while to figure out how to make the shape. Can you guess how I made the icing on top? 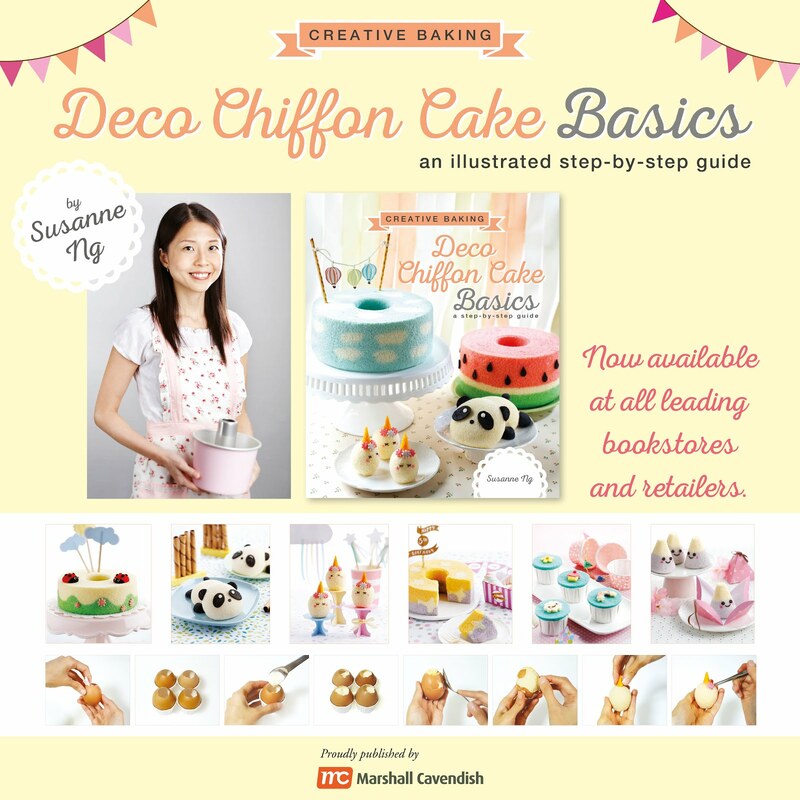 The recipe, with a yummy Peanut butter base is in Creative baking: Deco Chiffon Cakes launching in Sept! 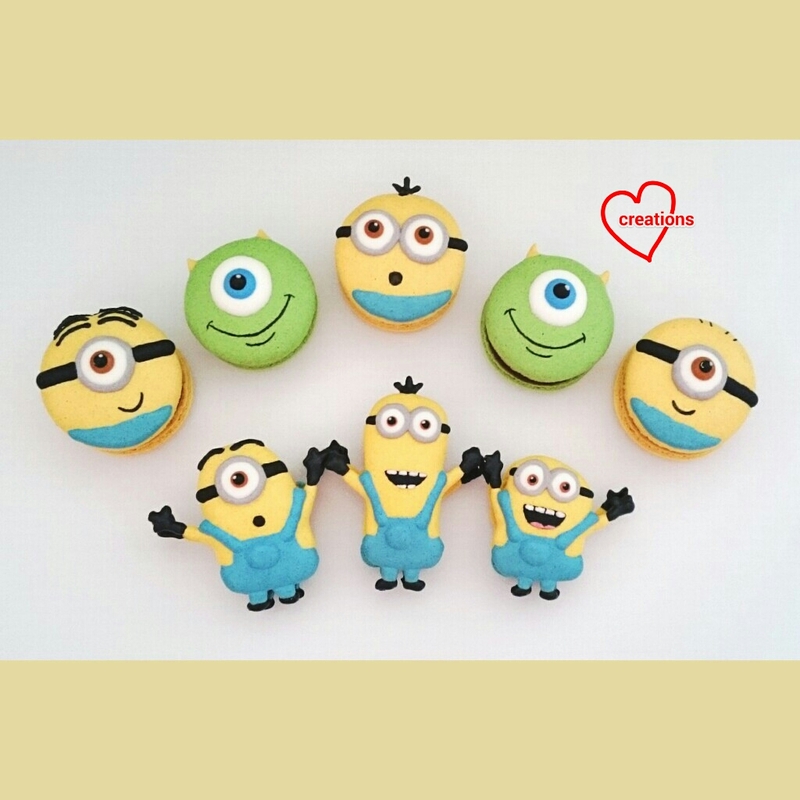 Hope you will enjoy the yummy creation! My cousin requested for music themed macarons for her mum who is a piano teacher. My aunt used to teach me piano when I was young. Ideas such as a quaver note or a grand piano macaron were considered. 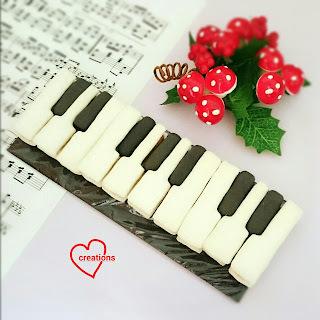 But I think nothing is as cool as a piano keyboard with a macaron as each key! Thank God for the inspiration that came out of nowhere! You may not realise these are macarons at first glance! 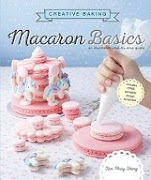 You may refer to this post for video tutorials or my Creative Baking: Macarons book for the techniques for piping simple angular shapes. 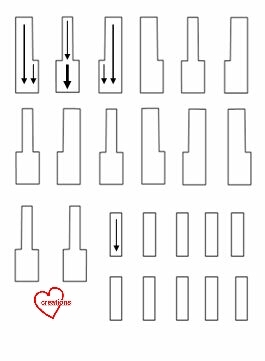 Template for one octave worth of keys on an A4 sheet. Arrows indicate how you should pipe. 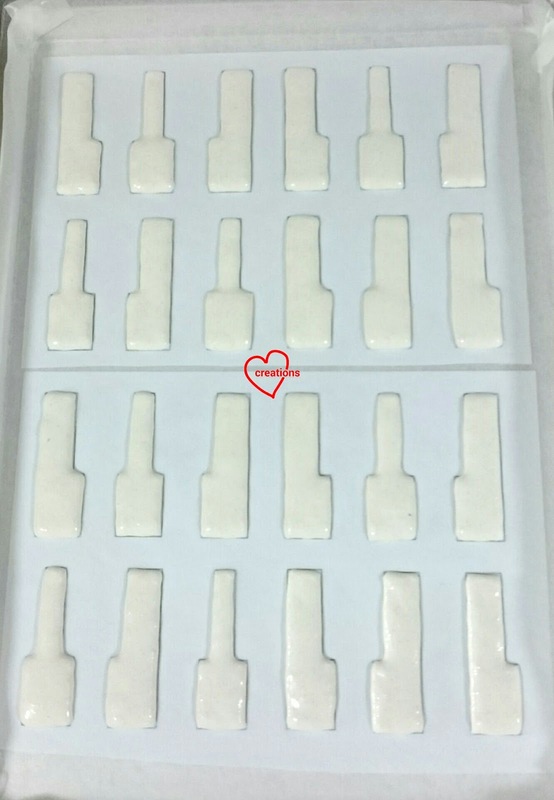 The thickness of the arrows indicate how much pressure you should apply on the piping bag. The thicker the line, the more pressure you should apply. Please acknowledge the source here if you use the template as I have taken time to make it. As quite a lot of batter movement with a toothpick is involved in creating sharp corners, I chose to use the regular macaron shell recipe instead of the reduced sugar version as I find the traditional recipe more amenable to manipulation without being "overfolded". I actually made these piano keys along with some woodland creature, Charlie Brown and Snoopy macarons (will post in the future!) but I will write down the full recipe here which would be enough for a few octaves of keys :p.
* use whatever powder or gel form of food colouring you have to obtain the desired colour. You may omit white colouring if you prefer. 1. Prepare baking tray with template on it and baking sheet over it. Use Italian meringue to stick the baking sheet down when you have made it. 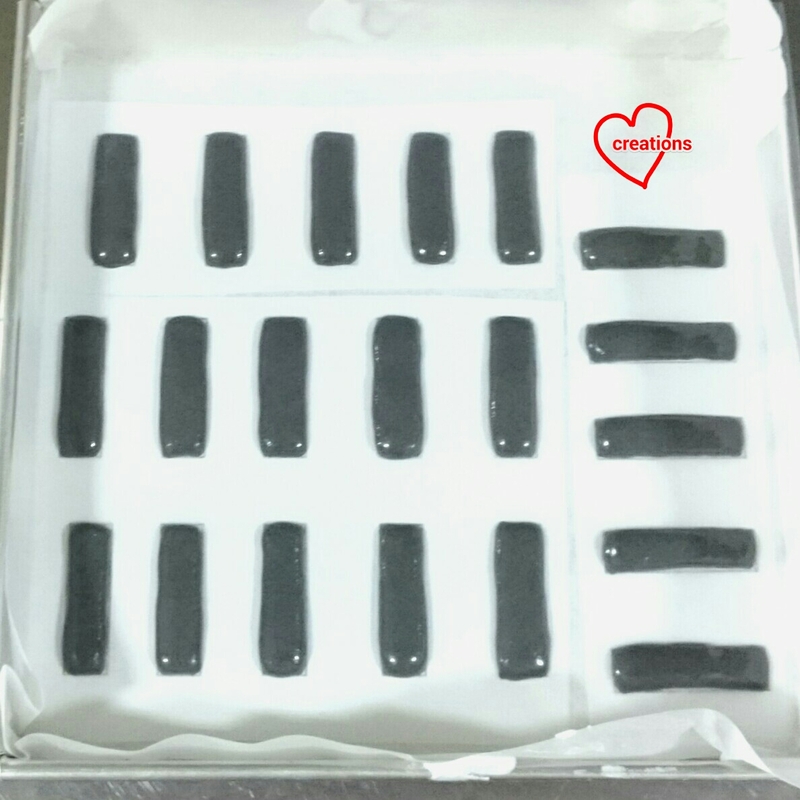 Please cut the portion of black keys out and place on another baking tray as black and white keys have different baking times. 2. Make the mass. Sift almond, salt and icing sugar together in a large mixing bowl. Add egg whites and mix well to form a thick paste. 3. Divide mass into ratio of 1:4 for black:white. 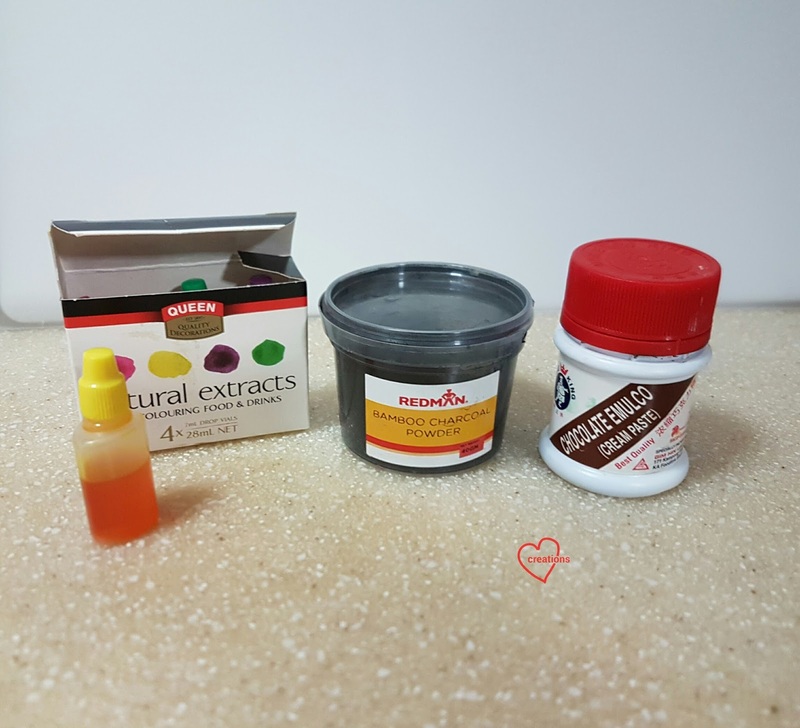 Add sifted powder food colouring (if using) and/or gel food colouring to the masses. Mix well. 4. Prepare Italian meringue. Heat caster sugar and water in a small saucepan until 115°C. While the syrup is heated up, beat egg whites with cream of tartar (if using) until soft peaks form at medium low speed. Reduce mixer speed if syrup temperature is not reached. Once syrup is ready, turn mixer speed to medium high. Carefully pour syrup into egg whites in a thin stream avoiding the beaters. Continue beating at high speed for another 10 minutes until stiff, glossy and cool. Divide the meringue into 1:4 for black :white. 5. Fold meringue into mass. Please refer to my video tutorials for the macaron basics on how to fold and test batter consistency. For these keys, underfold slightly as the batter will continue to be "folded" as you nudge it with a toothpick. Fold meringue into mass in two additions until batter falls off spatula in a slightly discontinuous manner. 6. 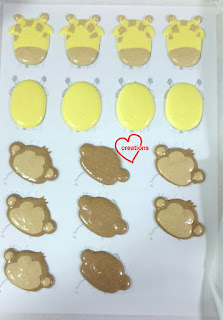 Transfer batter into piping bags fitted with #8 Wilton tip (about 4mm diameter). 7. Pipe the black keys as "narrow rectangles". 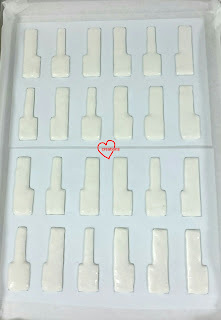 Using the same principle, pipe the white keys by tracing the outline of the keys and using a toothpick to nudge the batter into the corners. Bang the tray on the table after piping to release trapped air bubbles and flatten any peaks. Notes on piping: follow the arrows indicated on the template and the pressure you should apply on your piping bag. In order to get straight lines, try to keep the pressure constant as you trace the lines and keep the piping tip at a constant distance away from the baking tray. I know this may not be easy for those of you not used to piping. I can't get the lines perfectly straight either. You may use the toothpick to nudge any obvious "bumps" and mistakes in tracing. 8. Dry the shells in aircon room and/or under a fan for 1-2h or until you are able to run a finger across without it sticking to your finger. The black keys dry faster as they are smaller. 9. Preheat oven to 135°C, set rack to lowest position. Bake black keys for 10 min, rotate tray and bake for another 3 min. Bake white keys for 10 min, rotate tray and bake for another 7-8 min at 130°C. Bake until feet no longer appears wet. Note that baking time may vary as each oven is different. Cool completely before removing from baking sheet. I filled the black shells with dark chocolate ganache and the white shells with Earl grey white chocolate ganache. I made a customized cakeboard out of cardboard, black craft paper and cling wrap to fit the keys nicely into a box. My aunt loved the fact that the macarons are less sweet than commercially sold ones! This is so even though I used my regular shell recipe without sugar reduction. Choosing the right filling is the key to making macarons less cloyingly sweet. 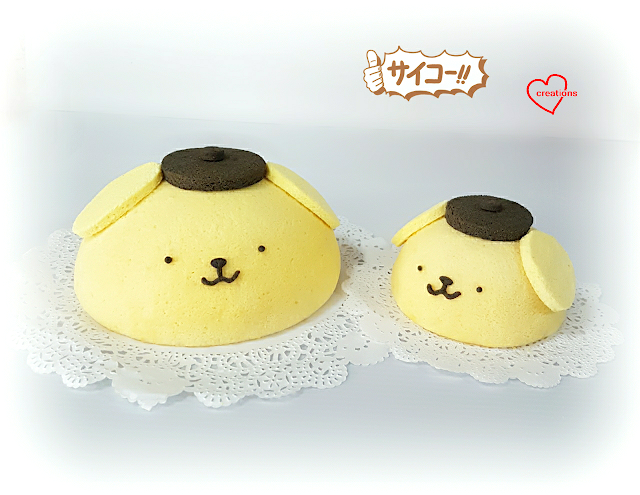 I made this Pompompurin Mango Yoghurt Chiffon Cakes a while ago for a Pompompurin lover friend! Do they look like there are talking to each other? 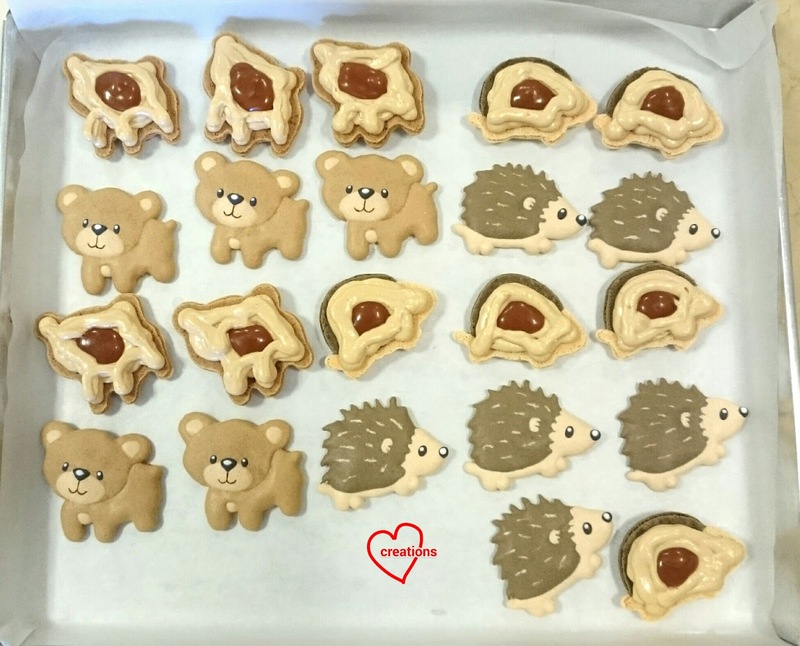 =) I heard there's a new Pompompurin cafe open in SG too. 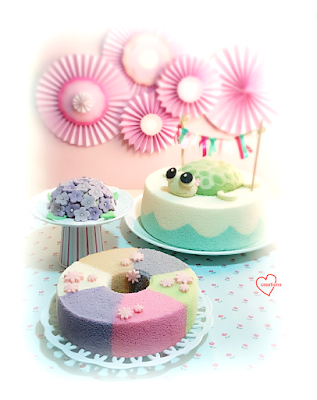 Hope these cute cakes brighten up your day! I am a lover of yoghurt chiffon cake and this mango yoghurt is so fragrant and delicious! No special Pompompurin moulds are needed! 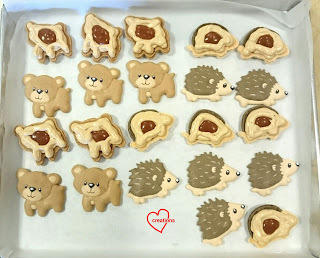 I baked them in a 15-cm Wilton ball cake pan and a 11-cm Iwaki glass bowl. The recipe below can also be used for a 17-cm chiffon tube pan, if you prefer to simply enjoy delicious and yummy mango yoghurt chiffon cake! 1. Preheat oven to 160°C. Prepare a one 15-cm ball cake pan, one 11-cm glass bowl and one 15-cm baking pan lined with baking paper. a. Whisk egg yolk with sugar until pale, light and well-mixed. b. Add in oil, mango yoghurt and lemon juice and mix well. 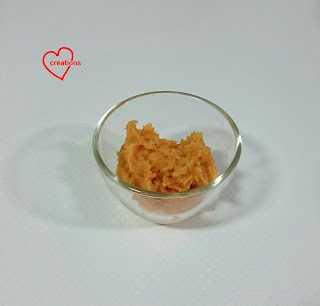 c. Whisk in sifted cake flour. Mix well and ensure no lumps are formed. a. In a grease-free, dry bowl, using electric mixer, whisk egg whites with cream of tartar till frothy (left). b. Add in ½ castor sugar for meringue and whisk at high speed till soft peaks form - peaks slope downwards forming a hook (middle). c. Add in rest of the castor sugar for meringue and whisk till firm peaks form - peaks point up but slightly hooked at the tip (right). 5. Transfer 1/3 meringue into egg yolk batter and fold in anti-clockwise direction till well-incorporated. Then gently fold in the rest of the meringue into egg yolk batter in another 2 additions. 6. Pour the batter into the ball cake pan and glass bowl, leaving 1.5+ cm from the brim. Gently tap on counter top to remove air bubbles. 7. Bake the ball pan at 160°C for 15 min then 140°C for 25 min, or until skewer inserted into centre of the cakes come out clean. 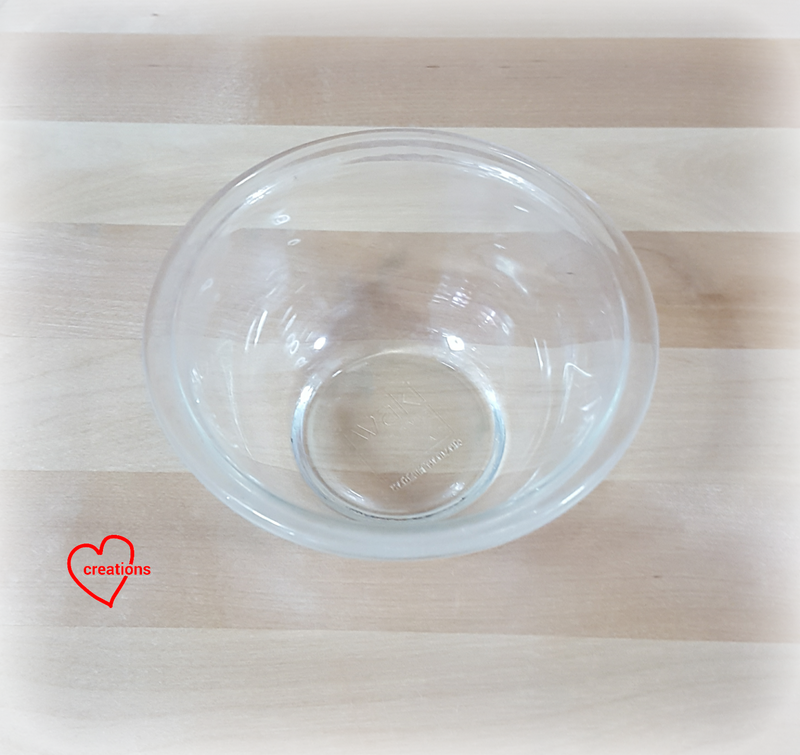 Bake the glass bowl at 160°C for 15 min then 140°C for 15-20 min similarly. 8. Pour the remaining batter into the prepared 15-cm baking pan. Bake at 160°C for 15 min, or until skewer comes clean. 9. Invert pan and bowls on a wire rack with good circulation to cool completely. Flip the sheet cake onto a new piece of baking papaer and cover with another baking paper to cool completely. 10. 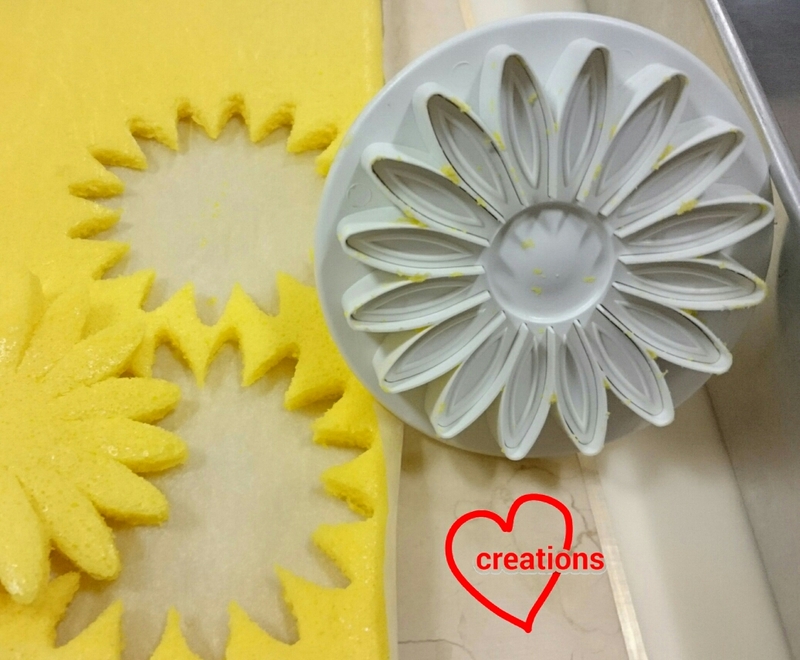 Unmould the cakes by hand by peeling off the chiffon cakes gently from the pan surface, and then inverting the cakes to release cake like in tube pans. 1. Preheat oven to 160°C. Line one 20-cm baking pan lined with baking paper. 2. Prepare egg yolk batter: Whisk egg yolks with sugar like pale colour. Add oil, water, vanilla extract and chocolate paste and mix well. Whisk in sifted flour and mix well. 3. Prepare meringue: Whisk egg whites with cream of tartar till frothy. Add in castor sugar in 2 additions, whisking the meringue at high speed till firm peaks form. 4. Gently fold meringue into egg yolk batter in 3 additions. 5. Pour the batter onto the prepared pan. Gently tap on counter top to remove air bubbles. 6. Bake at 160°C for 15 min, or until skewer comes clean. 7. Flip the sheet cake onto a new piece of baking papaer and cover with another baking paper to cool completely. 1. 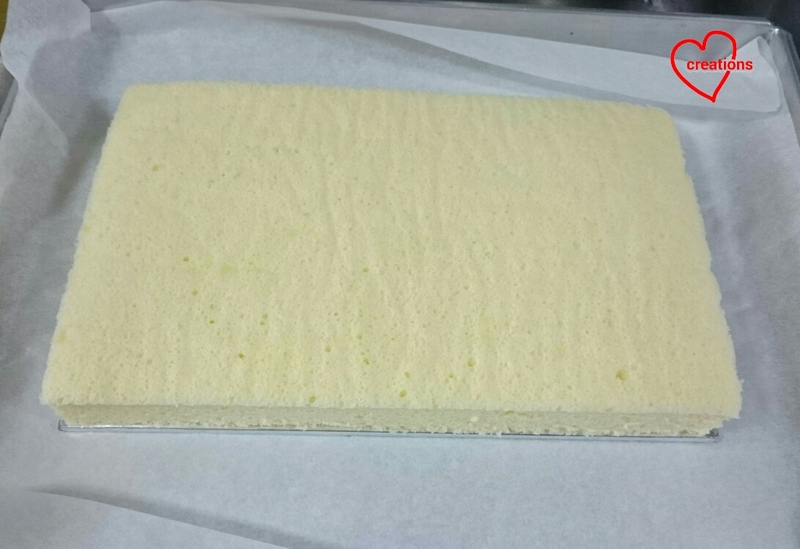 Place mango yoghurt sheet cake onto cutting mat. 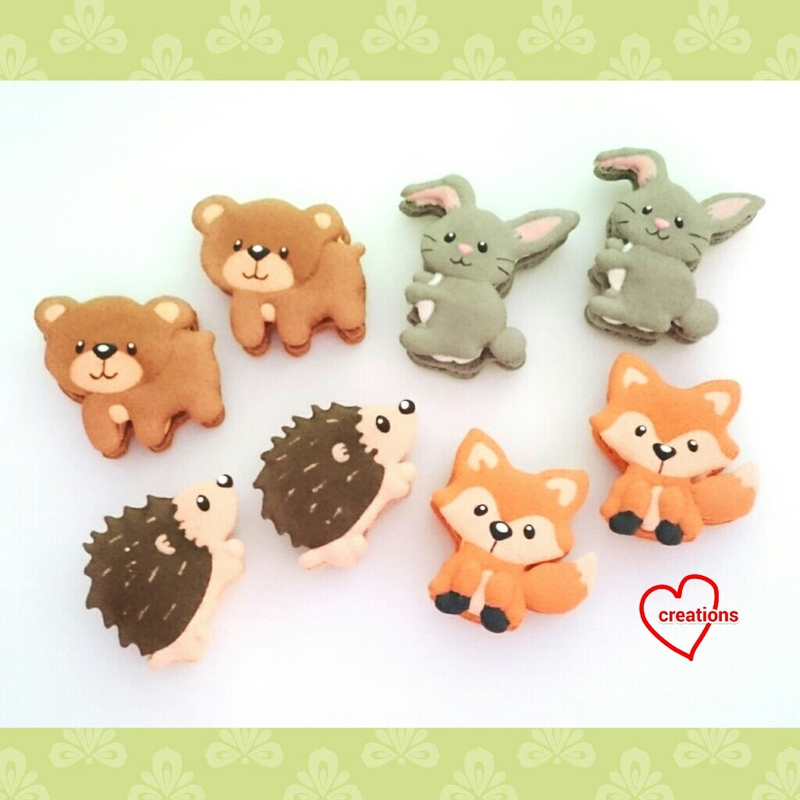 Cut out pompompurin ears using oval cutters. 2. Place chocolate sheet cake onto cutting mat. Cut out hats using circle cutters. 3. Cut out their eyes and facial features using bento face cutters. My humble video tutorial is here, posted on TODAY's fb page. Very very thankful for my Creative chiffon to be featured in TODAY newspaper (10/9/2016 issue). 1. Preheat oven to 160°C. 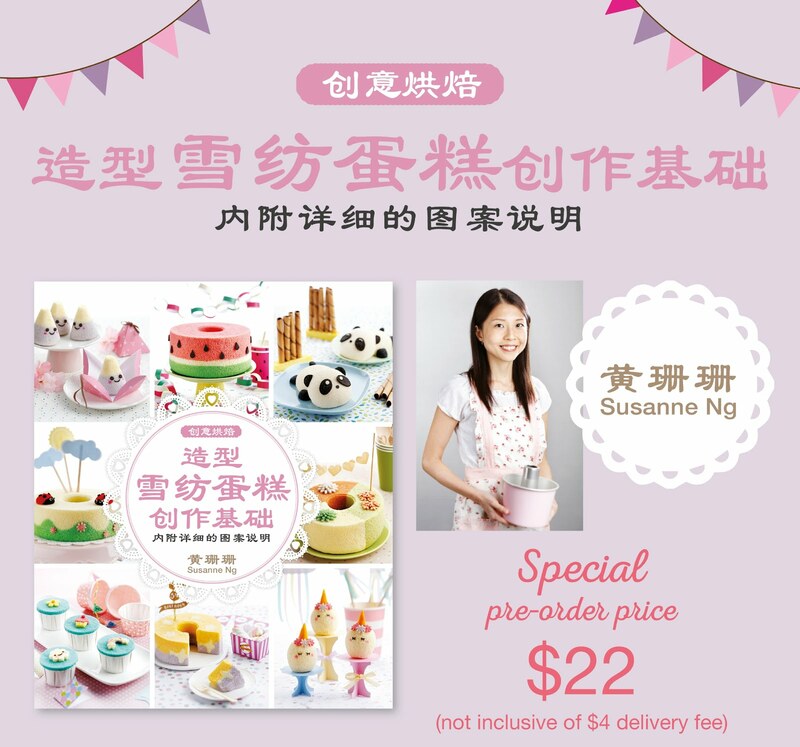 Prepare a one 15-cm ball cake pan, one 15-cm baking pan lined with baking paper and one 18-cm baking pan lined with baking paper. b. Add in oil, water, vanilla extract and mix well. 4. Transfer 10 tsp batter into another bowl and add pinch of charcoal powder and 1/2 tsp of chocolate cream paste. 6. Transfer out 20 tbsp meringue for the brown batter. Gently fold the rest of the meringue into the vanilla batter in 3 additions in the same direction. Do likewise for the brown batter. 7. Pour the vanilla batter into the ball cake pan, leaving 1.5+ cm from the brim. Gently tap on counter top to remove air bubbles. 8. Bake the ball pan at 160°C for 15 min then 140°C for 25 min, or until skewer inserted into centre of the cakes come out clean. 9. Pour the remaining batter into the prepared 15-cm baking pan. Bake at 160°C for 15 min, or until skewer comes clean. 10. Pour the brown batter into the prepared 18-cm baking pan. Bake at 160°C for 15 min, or until skewer comes clean. 10. Invert ball pan on a wire rack with good circulation to cool completely. Flip the sheet cakes onto a new piece of baking papaer and cover with another baking paper to cool completely. 11. 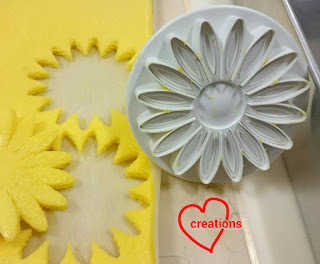 Unmould the cakes by hand by peeling off the chiffon cake gently from the pan surface, and then inverting the cakes to release cake like in tube pans. 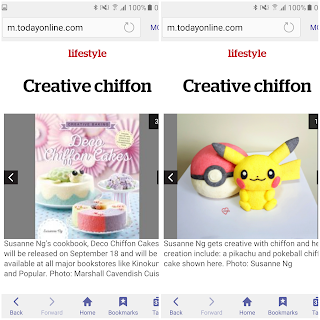 Read more on Creative chiffon feature in TODAY newspaper (10/9/2016 issue) (I didn't manage to get a print copy). Thankful to God for providing so much on this journey! 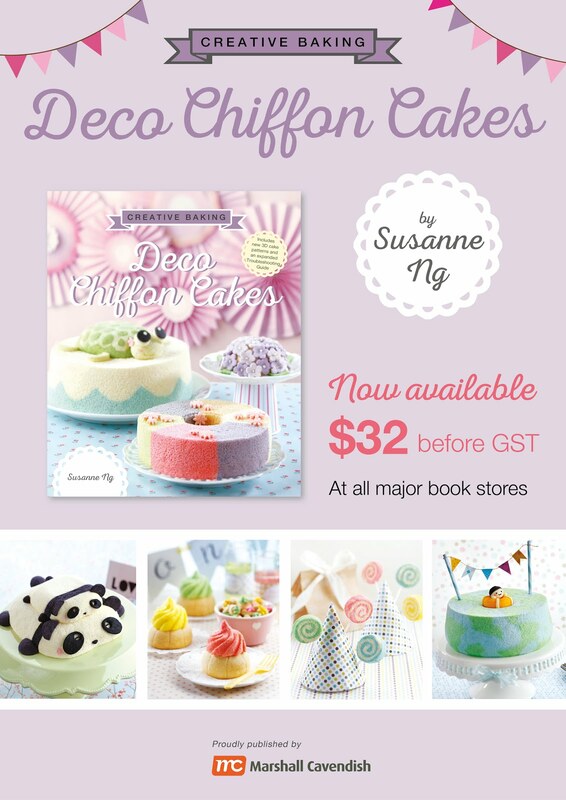 New cookbook Deco Chiffon Cakes launching in bookstores around 23rd Sept! 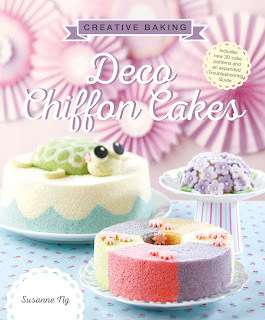 With 3D patterns, cute animals and new trending flavours like salted egg lava chiffon cake!